The chance of an armed, foreign invasion on U.S. soil is slim. But if one of America’s NATO allies goes to war, the US could be forced to join the fight as well. NBC News Foreign Correspondent Lucy Kafanov visited Norway for the largest NATO military exercise since the end of the Cold War. In Liverpool this weekend, we were treated to an unusual sight: Giants roaming the streets. This was puppetry of colossal proportions — brought to us by the French street theater company Royal Deluxe. It was the third time these gentle giants visited Liverpool, and the last the world will get to see them. We were lucky enough to experience the magic and the wonder — reminding us all to dream big. So excited to share this story with you all. I was lucky enough to travel to the Lofoten Islands in Northern Norway for the TODAY Show. How far would you go to find the perfect wave? Surfers from across the globe have been flocking to Unstad, Norway – deep in the Arctic Circle – drawn by the wild, rugged terrain, the perfect waves, and a totally different type of experience to that found in the crowded tropic surf spots. Advances in wetsuit technology has opened some of the most frigid reaches of the world — Alaska, Antarctica, Canada, Greenland, Iceland, Norway, Russia, Sweden — to surfers seeking isolated adventures and unexplored waves. 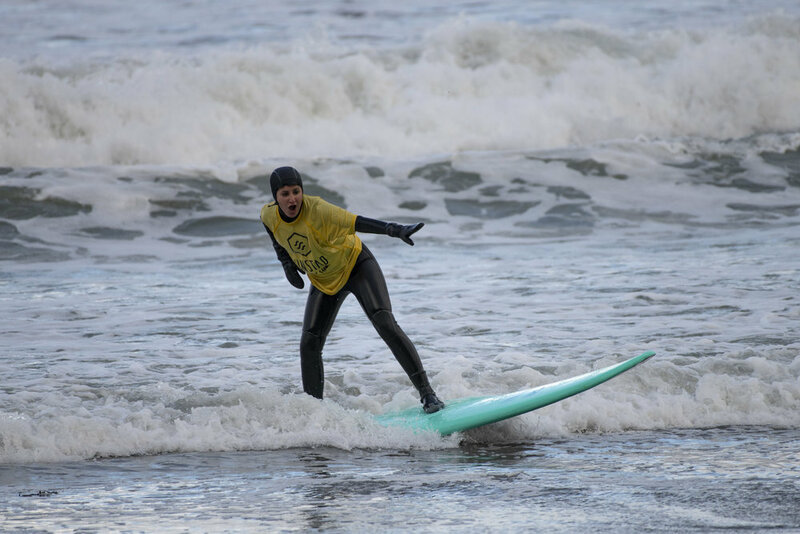 Unstad is home to the world’s northernmost surf school, which takes visitors surfing all year round and has seen a big increase in the number of American surfers. Plus, bucket list CHECK: I got to see the the awe-inspiring Aurora Borealis in action! NBC’s Lucy Kafanov and her crew shooting the TODAY Show story about surfing in the Arctic. NBC’s Lucy Kafanov surfing the Arctic waters for the Sunday TODAY Show with Willie Geist. As President Donald Trump seeks to open the Arctic waters for offshore oil and gas drilling, there's a race unfolding for the remote region's mineral wealth. Russia's military is on the march in the arctic - its biggest push in the region since the fall of the Soviet Union. NBC's Lucy Kafanov is the first American journalist to get access to Russia's newly-formed arctic brigade on the northern frontier near the border with Finland. She is the iconic face of democracy in a country crushed by more than a half-century of military rule — a former political prisoner, Nobel laureate and the head of the National League for Democracy party, which saw a landslide victory in November. But of all the titles granted to Aung San Suu Kyi in recent years, the president of Myanmar, for now, will not be one of them. YANGON, Myanmar — After more than five decades of isolation and repressive military rule, Myanmar on Monday swore in hundreds of lawmakers in its first freely elected parliament. It follows a Nov. 8 election that saw Nobel Peace Prize laureate Aung San Suu Kyi’s National League for Democracy party win two-thirds of available parliamentary seats and effectively rout the country’s military leaders. Suu Kyi won a landslide election in 1990 that was later annulled by the military. It was the nightmare scenario analysts warned about ever since Russia formally entered the Syrian conflict: Turkish fighter jets shot down a Russian warplane near the Syrian border on Tuesday, dramatically escalating tensions between the NATO member country and Moscow while raising the prospect of further chaos in the Middle East. In my latest story for Newsweek, I examine Germany's reaction to the devastating attacks in Paris and whether they are likely to affect Berlin's open-door policy towards refugees. I also contributed some reporting to Bill Powell's excellent cover story for the magazine, Paris Attacks Show 9/11 Changed Everything and Nothing. If you have a few spare minutes, it is worth a read.